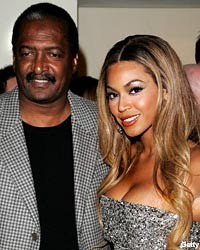 After years of success and what some deemed as undying loyalty (favoritism maybe) Matthew Knowles the guy who is looked upon as the mega manager who drove his daughter Beyonce's career to the stratosphere is no longer going to be managing it. Beyonce & her dad have ended their business relationship that began after he saw a gift in her as a child and quit his corporate job to manage her career full time. Details after the jump! There have been many rumors over the years of Matthew and Bey ending their business relationship for many different reasons. First it was that she was letting her husband Jay Z take over her career, then after news hit of Matthew's affair & love child with another woman other than Beyonce's mom Tina, Bey was said to be leaving Music World. "Business is business and family is family. I love my daughter and am very proud of who she is and all that she has achieved. I look forward to her continued great success." "I am grateful for everything he has taught me, I grew up watching both he and my mother manage and own their own businesses. They were hardworking entrepreneurs and I will continue to follow in their footsteps....He is my father for life and I love my dad dearly. I am grateful for everything he has taught me." I know Beyonce's career is far from over and I hope that who ever is steering it next can put as much heart and care into it as it seems her dad has done. Wish both of them well!